Promote Farm Bureau-led solutions that benefit California family farms and ranches. More information will be posted here as made available. In collaboration with government and university specialists, organizations representing fresh-produce farmers and handlers have written enhanced food safety practices for the growing of leafy greens. Organizations cooperating in the project include California Farm Bureau Federation, Western Growers Association, Grower-Shipper Association of Central California, Produce Marketing Association and United Fresh Produce Association. The practices affect production of iceberg lettuce, romaine lettuce, green leaf lettuce, red leaf lettuce, butter lettuce, baby leaf lettuce (i.e., immature lettuce or leafy greens), escarole, endive, spring mix, spinach, cabbage, kale, arugula and chard. The practices have been accepted by the Leafy Greens Handler Marketing Agreement Advisory Board and may be viewed on the board Web site. The board will oversee inspections, conducted by the California Department of Food and Agriculture, that verify compliance with the food safety practices. Farm Bureau continues to work towards implementation of the Food Safety Modernization Act, a federal update to food safety regulations. Many of the requirements of FSMA are similar to the LGMA guidelines. Commodity Specific Food Safety Guidelines for the Production and Harvest of Lettuce and Leafy Greens. Accepted by the LGMA Advisory Board, these are the food safety practices that LGMA members are required to implement in order to comply with the program. A resource for science-based information about the safety of organic and conventional produce; use facts, not fear, to make healthy food choices. Try the pesticide resedue calculator to see the true exposure risks of produce in our food supply. Scared Fat: Are consumers being scared away from healthy foods? We Don’t Eat Nearly Enough: Only one in 10 Americans eat enough produce each day, according to the Centers for Disease Control. Slight Increases Can Prevent Diseases: If half of Americans increased their consumption of fruits and veggies by a single serving each day, 20,000 cancer cases could be prevented annually. 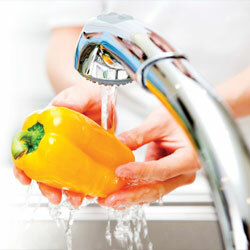 Washing Removes Residues: Washing organic and conventional produce under running tap water often removes or eliminates any minute residues that may be present, according to the Food and Drug Administration. People Who Eat More Are Happier: Peer reviewed studies show mental well-being rose in accordance with the amount of fruits and vegetables consumed. Continually Tested for Safety: Over 99% of the produce sampled by USDA had pesticide residue levels below tolerances established by the Environmental Protection Agency. And 50% of foods sampled by the FDA had no detectable residues at all. But there’s more! Fruits and veggies comprise the only food group that health experts everywhere agree we should all eat more of every day for better health and a longer life. And, since farmers’ own families are their first consumers, food safety is always their priority.